It looked like we should look a bit about LINQ fundamentals before we actually get into the core programming for our Silverlight twitter application. So we’ll look into LINQ for a few more posts, then we will proceed with our usual Silverlight stuff. 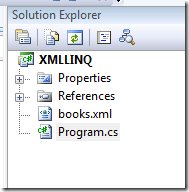 Line INtegrated Query allows us to use Query language to select data from almost any type of data sources like XML, SQL, Objects, etc.... For more information about LINQ, visit this page, I don’t want to get deep into the details.
. Or you get it from http://msdn.microsoft.com/en-us/library/ms762271(VS.85).aspx. Go through this xml document, it will help in better understanding. Now let us quickly get into some hands on coding stuff. 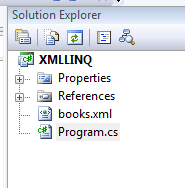 Now you have the xml document in xmlDoc variable and now on we’ll be querying against this variable. //The actual query, where we choose all the books that are of "Computer" genre. 4) Then the next step is to iterate through this and print out the desired values. 5) Then I am going to use the variable query from step 3 to find out how many Computer genre books are priced more than 40. This can be done using the query below. We will look into LINQ for SQL, group by and sort queries in next post. Please post leave your comments below.